Your chance to win a Yamaha A-S801 integrated amplifier worth �799.95. These five foot high hybrid electrostatics impress noel Keywood. A tiny new portable digital player from Plenue reviewed by Jon Myles. A complete system for �1500 that wows Jon Myles. Jon Myles listens to a new specialist amplifier. A high power but affordable mains regenerator, reviewed by Noel Keywood. 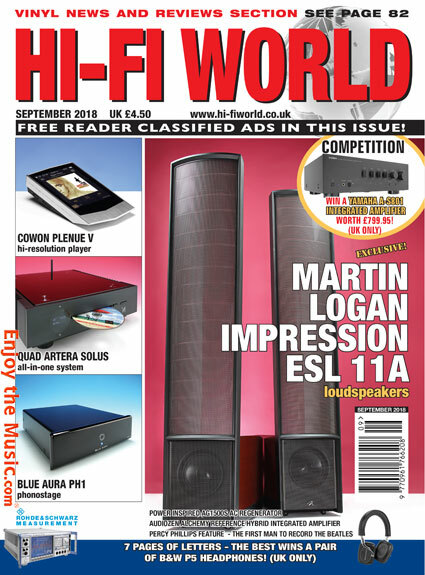 Noel Keywood covers a "left field" topic of hi-fi � producing clean mains power. Jon Myles checks out a FiiO Bluetooth adaptor and Paul Rigby some isolation feet. Martin Pipe peers closely at an old fave from the 1970s you can find at boot sales today. A simple, inexpensive mm/mc phono stage gets Martin Pipe's close attention. Paul Rigby on the first man to record the Beatles (quarrymen!). A fascinating insight. Paul Rigby reviews an encyclopedia of Motown history. Paul Rigby looks at classic buffalo Springfield again. 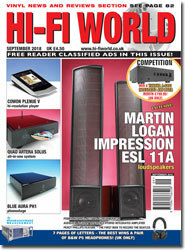 Click here to subscribe to Hi-Fi World.